Now you find us on Facebook Facebook. After a longer creative break, NBY’’ is back. 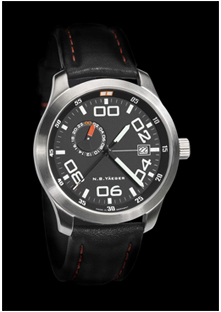 We are glad to be able again to set a trend-setting course in the field of watch design. NBY'' maxim: no watch without ideas . . .
You know what I mean: you are observing the market, are full of respect for one watch or another. But most of the time, mostly in the mid-price segment, a tiresome lack of imagination dominates. Within the single brands quite a chaos of designs and approaches, a little bit of this and a little bit of that. With NBY we have made it our business to solve exactly this problem. If you take the time to view what has derived you are going to identify a clear design approach. This line is also going to be drawn for the following watches. Again according to the maxim: no watch without ideas, creating something new instead of following old hats! PIC LEFT: The Lima represents the design approaches of a further NBY generation. Here, the focus is also on a clean design in the cockpit style. A unique feature is the 24h-indication at 10 o’clock with a distinctive cockpit hand which has specifically been designed by Martin Braun.